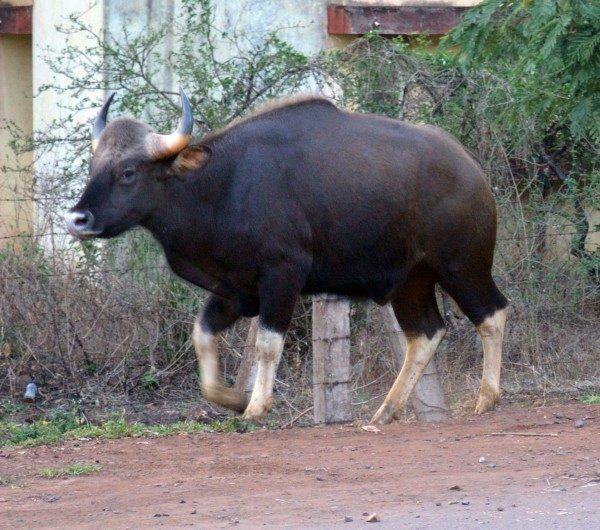 May be due to dearth of food and water a 3 year old Bison from the Kakti Jungles strayed into the Hindalco Colony and was unnoticed the entire morning as a common ox or cow. But when it was identified as a bison the Deputy Conservator of Forests and his team rushed to the spot and drove the bison back into the woods. Forest officials used crackers in shooing the 3-year-old bison back in Kakati jungles. This is the first time that such an incident has occurred near Hindalco colony. About 6 years ago a 2 year old bison was run by a vehicle on the NH 4. Forest officials thank you for your actions and care words animals and Please dig small ponds in all the forest areas so that in the coming monsoons water can be stored.